Register now and future proof your data management architecture with Oracle Cloud. Julien Testut is a Senior Principal Product Manager in the Oracle Data Integration group focusing on Oracle Data Integrator Cloud Service, Oracle Data Integrator and Cloud Data Integration solutions. Julien has an extensive background in Data Integration and Data Governance solutions as well as Big Data and cloud technologies. Julien is a co-author of the ‘Getting Started with Oracle Data Integrator 11g: A Hands-on Tutorial’ and ‘Oracle Data Integrator 11g Cookbook’ books. Prior to joining Oracle, he was an Applications Engineer at Sunopsis, which was then acquired by Oracle. Julien holds a Master’s degree in Software Engineering. In this free course, you will learn to use Oracle’s Cloud tools and solutions to speed up application development lifecycles, and ensure predictability for both developers and operations personnel. Lessons will be released from January 13, 2017 through February 3, 2017. The lecture is through videos, which are available 24/7. Take the course at your own pace, and interact with other students (and the instructors) through the forum. Each week, one or more lessons will be released. Each lesson contains the video materials to watch, homework and exercises for you to work on, and a quiz to assess your learning. • Login to the page. • Click the Enroll button. Please note: Enrollment is a multi-step process. Until your enrollment is approved, you will not have access to the course materials. • We designed Oracle Massive Open Online Courses (MOOCs) to provide you with the training you need anytime, anyplace and completely free! Our focus is to help you sharpen a set of skills that you can apply right away. We focus on current products and technologies, and our experts develop the MOOC content. What do you do in a MOOC? You will watch high quality video lectures, work on hands-on labs, and take quizzes. We help you create a lab environment to work in, or provide one for you. Through our dedicated forums, you have access to our experts, and can interact with others enrolled in the MOOC. We hope to see you in a MOOC soon! access to data is essential. Hortonworks and Oracle can provide comprehensive solutions that allow organisations to respond rapidly to data events. How Oracle GoldenGate empowers organisations to capture,route, and deliver transactional data from Oracle and non-Oracle databases for ingestion in real-time to HDP :registered:. 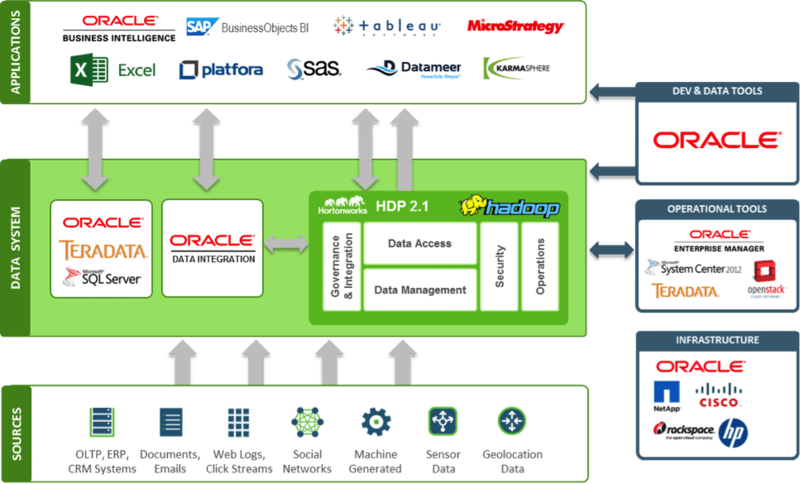 How GoldenGate complements HDF providing optimised delivery to Hadoop targets such as HDFS, Hive, Hbase, NoSQL, Kafka, to support customers with their real-time big data analytics initiatives. Attend this webinar to learn how Hortonworks and Oracle can help you with your real-time big data analytics and streaming initiatives! Whitepaper: Does Data Modeling Still Matter in the Age of NoSQL and Big Data? During the last few years, several database market dynamics have led many people to question the utility of data modeling. In particular, the advent of XML information management, growing frustration with traditional relational database management system (RDBMS) capabilities and vendor relationships, and the expanding influence of cloud platforms have led many organizations to reconsider their commitments to the practice of data modeling. Read this paper for perspectives on why data modeling is more important than ever before, and that organizations that seek to fully leverage database market dynamics must redouble their focus on data modeling.